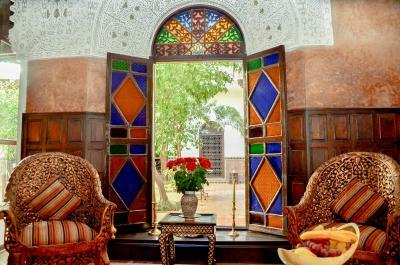 Lock in a great price for Riad ILayka – rated 9.5 by recent guests! Really friendly staff and the food (especially dinner) is delicious. The bed was comfortable and the rooftop was an oasis from the city madness. 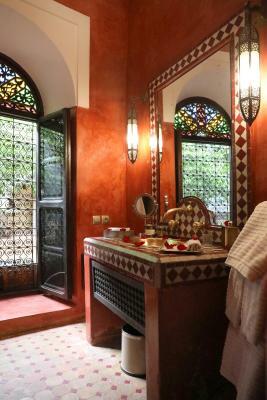 Excellent property built and decorated around traditional Moroccan architecture and gives you a feel of living inside a Moroccan home. It's more like a home than hotel and the staff is very friendly and take care of all you needs. It's the first time we stayed in a hotel where there were no keys required for the rooms. We could leave everything open and it was still very safe. 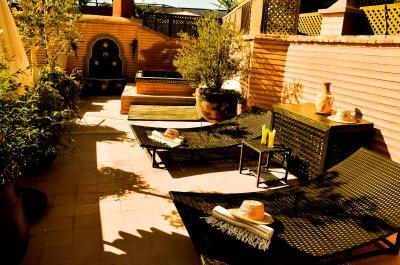 It had a nice terrace pool and beds for sunbath. 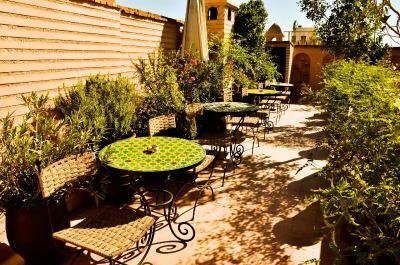 From the terrace you can see the beautiful sunset behind the Koutubia Mosque and amazing view of the Atlas Mountains. 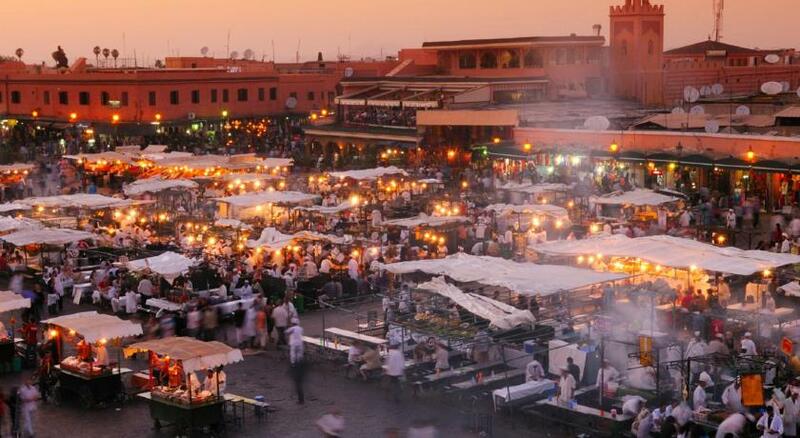 It's a 5 min walk from the Riad to the main square - Jemaa El-Fnaa. 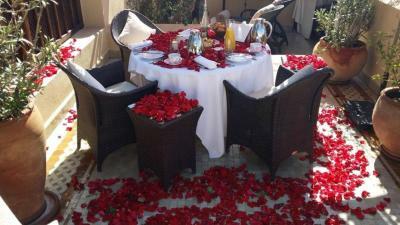 The breakfast was awesome and there was a personal touch in everything. 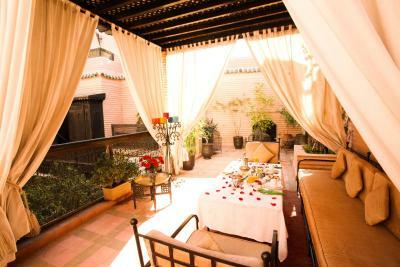 My 4 year old son loved the place and he wanted to stay more in the Riad than going out. It was a great hospitality by Nadia, Houla, Azdeen, Abdel and Mohammed. 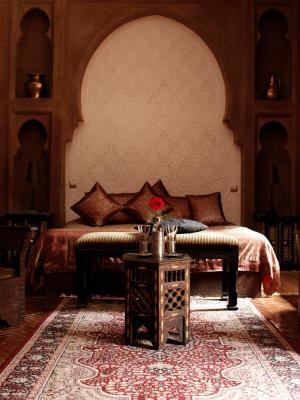 We'd highly recommend this place if you want to experience traditional Moroccan home. 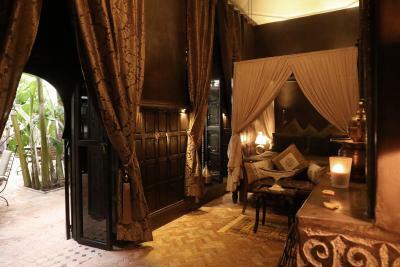 What I liked was that the room was spasious.The staff were outstanding.They went the extra mile to accomadate. 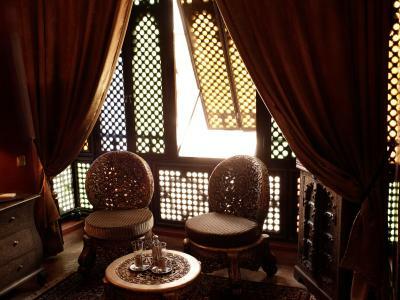 The Riad was dated yet authentic. STAFF was perfect! 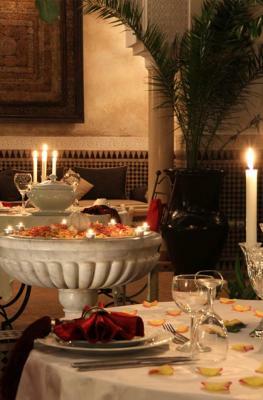 Hospitality, food, service, & the riad was BEAUTIFUL! Location is nice although we got lost while looking for it. Don’t trust google maps! The room was perfectly curated and gorgeous. Staff were super helpful. 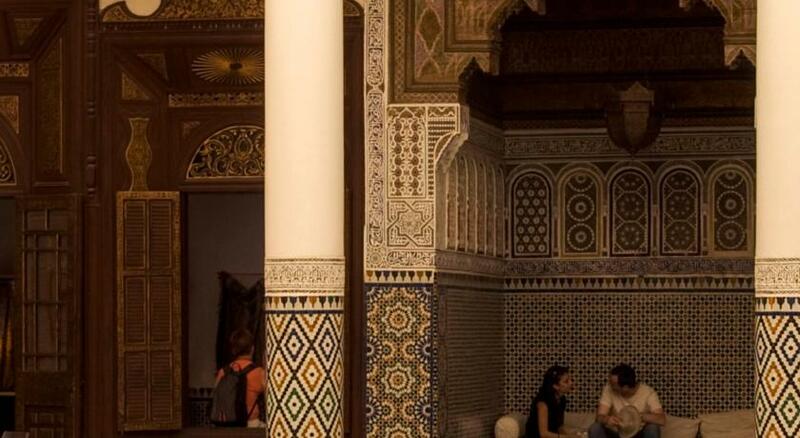 It's in the middle of the medina but so quiet and peaceful. A wonderful place made of beautiful people! 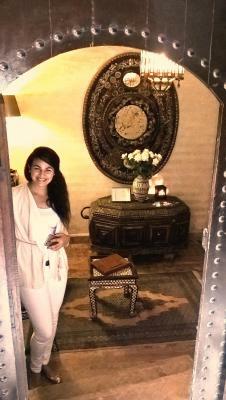 Our stay at Riad Ilayka was perfect, from all point of view. Teresa and Mohammed are excellent hosts, I really hope to have the chance to go back soon. 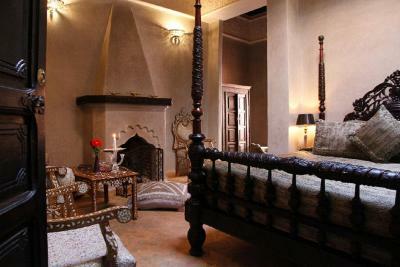 Amazing room with beautiful furnishings - the whole Riad was peaceful and quiet restful place. 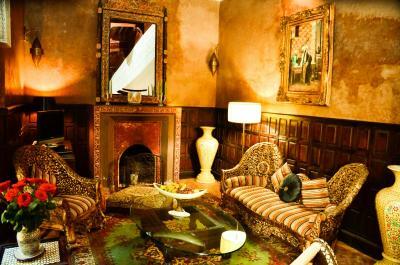 The staff were extremely helpful and accommodating with organising things for us. 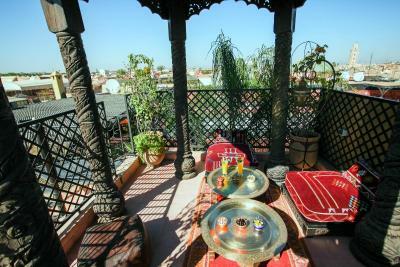 The rooftop is amazing to watch the sunset and rise with views over the city and enjoy a cocktail. 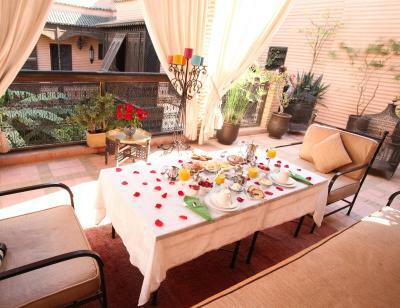 Lovely big breakfast with fresh ingredients in peaceful surroundings. 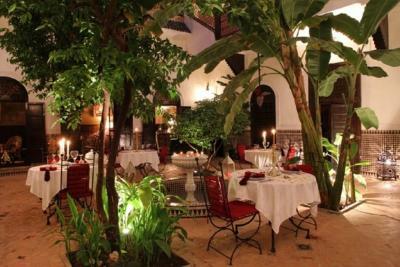 One of our top picks in Marrakesh – and a guest favorite. 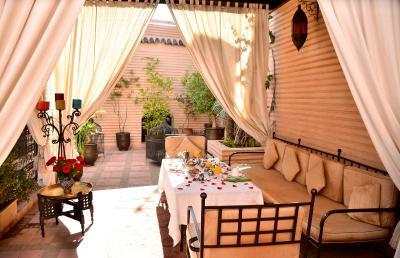 In Marrakech, this guesthouse is a 5-minute walk from Jamaâ El Fna Square. 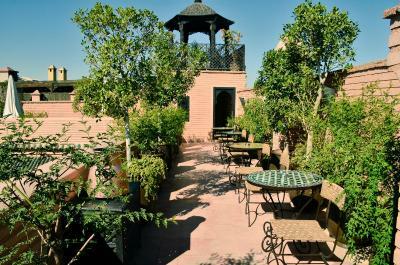 Guests can enjoy the patio with mandarin trees and the rooftop terrace with a hot tub-style water basin, and a view of the Atlas Mountains. 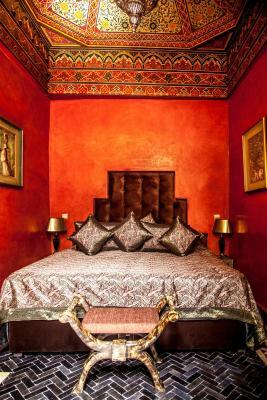 All the rooms at Riad ILayka are uniquely decorated in traditional, Moroccan style with antique furniture. 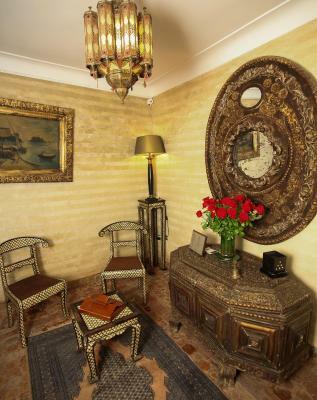 They all have a furnished sitting area and a private bathroom. 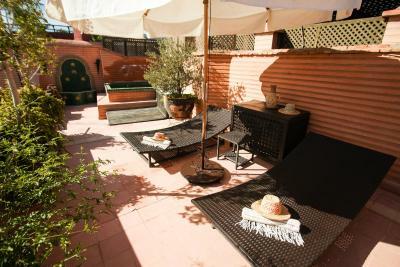 Some of the guest rooms provide direct access to the terrace. Breakfast is included and served every morning in the communal lounge, on the patio or on the rooftop terrace, by the pool. 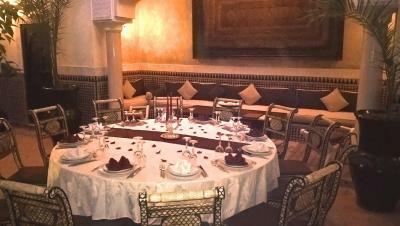 A guest table with Moroccan dishes is available and guests can also take Moroccan cooking lessons. Other facilities include free Wi-Fi and a 24-hour front desk. 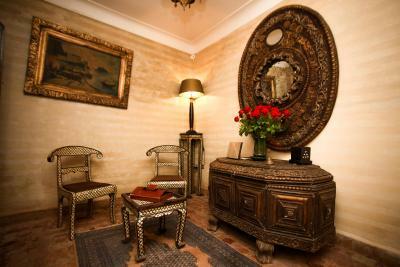 The hotel is 6 miles from Marrakech Airport and transportation can be arranged upon prior reservation. 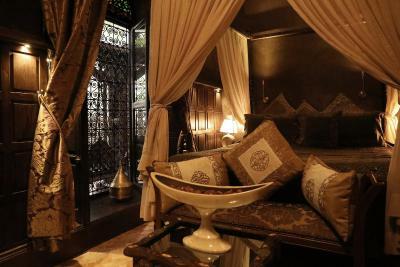 When would you like to stay at Riad ILayka? 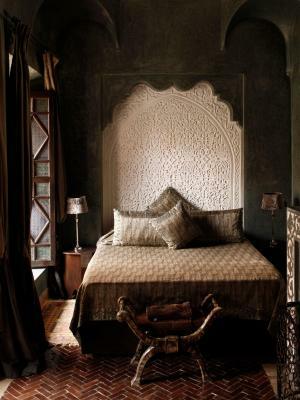 This room is decorated in traditional, Moroccan style with antique wood furniture and purple tones. 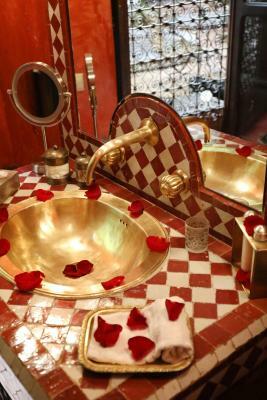 It features a fireplace, a furnished sitting area and a private bathroom with a bathtub or shower. 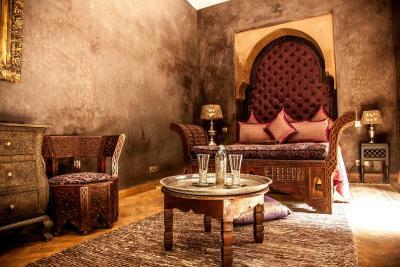 This air-conditioned room is decorated in traditional, Moroccan style with antique wood furniture and kaki tones. 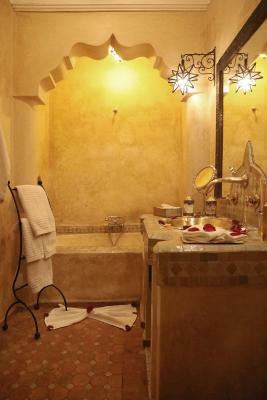 It features a fireplace, a furnished sitting area and a private bathroom with a bathtub or shower. 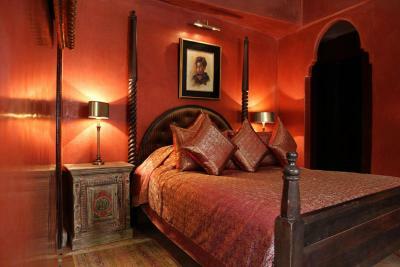 This air-conditioned room is decorated in traditional, Moroccan style with antique wood furniture and warm, red tones. 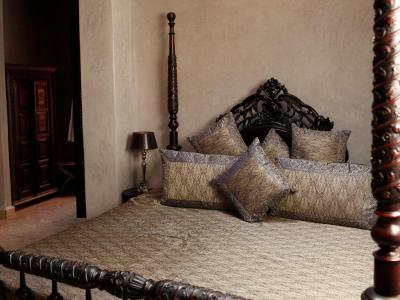 It features a fireplace, a furnished sitting area and a private bathroom with a bathtub or shower. 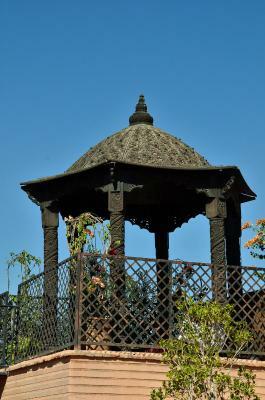 It provides direct access to the terrace. 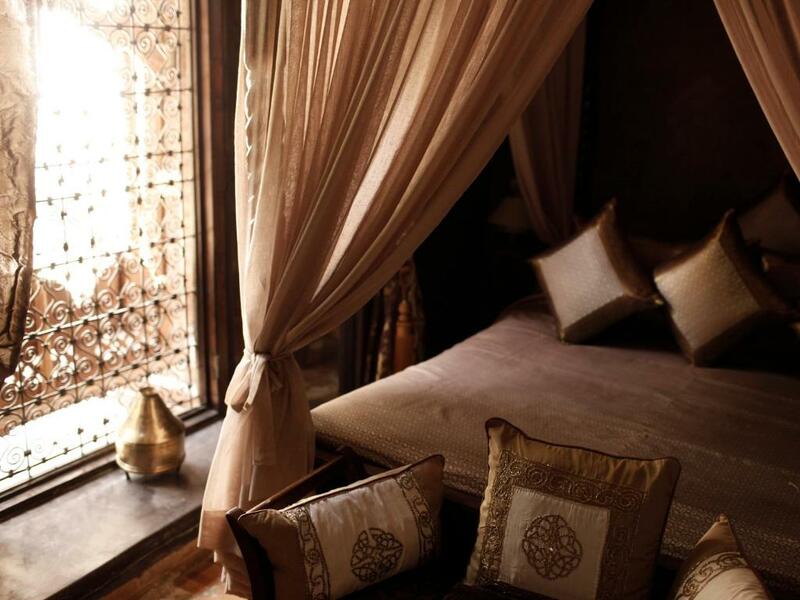 House Rules Riad ILayka takes special requests – add in the next step! 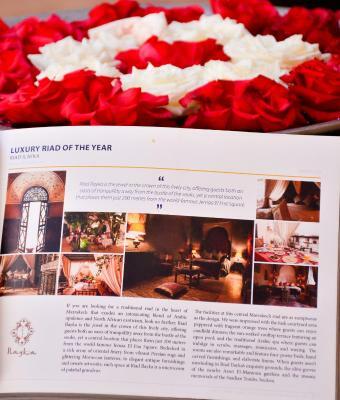 Riad ILayka accepts these cards and reserves the right to temporarily hold an amount prior to arrival. 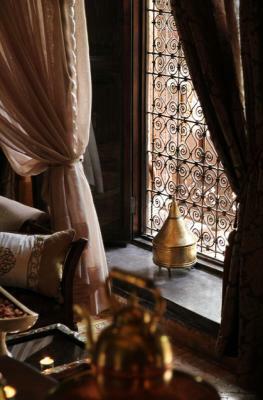 Please inform Riad ILayka of your expected arrival time in advance. You can use the Special Requests box when booking, or contact the property directly using the contact details in your confirmation. 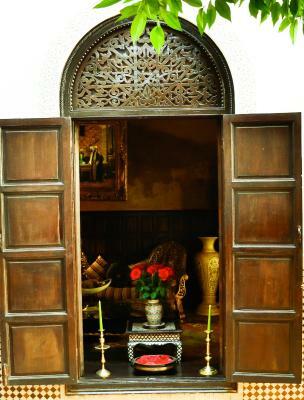 At Riad Ilyaka we felt at home in the otherwise bustling Médina. 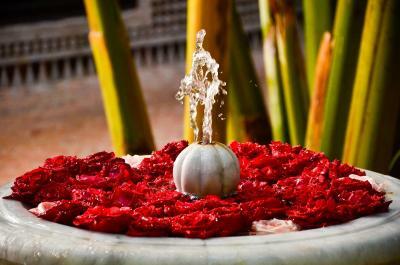 The entire staff from the management team to the concierge gentlemen are committed to providing a comfortable stay. It is clear that the team prides itself on offering a 360-degree experience. Azeddine was the highlight for us. He is a gentle-soul with a warm smile who goes the extra mile without expecting anything in return. This is superb service. 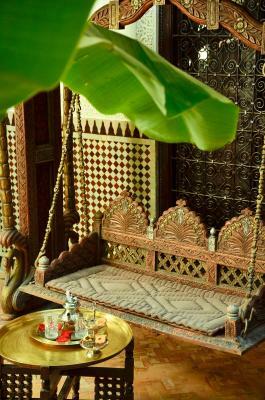 We recommend organizing excursions, tours or inquiring at the Riad, as they validate legitimacy. 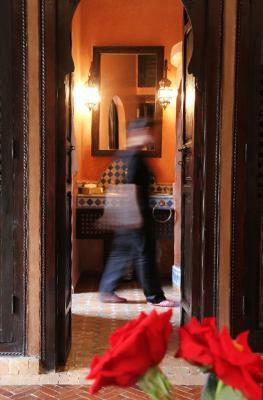 The best part about staying in a Riad is the authentic cultural experience. You do have take a few turns in the alleyways to find the entrance, but the staff offers to help navigate until you feel comfortable with the route. At no point did we ever feel unsafe. There is only one way in and out, with a bolted door which the staff controls. At night there is a security guard outside a hostel in the alleyway which also keeps an eye on any traffic. The rooftop is also locked down late at night for extra security. A safe is provided in the room. On our last evening, the staff organized a private cooking class. We had so much fun shopping in the market hall and picking the spices. The chefs talked us through every step so that we can recreate the dishes at home. The tagine we made was the best we had! 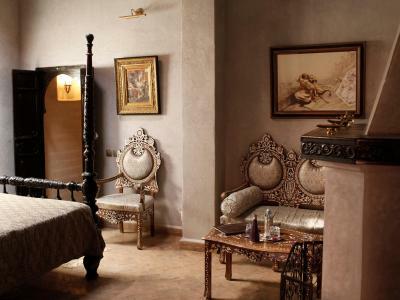 Finding this riad is frustrating, to say the least. Online maps do not show the alleyways necessary to access the property. We walked in circles every time we tried to get “home”. It’s particularly bad at night after the recognizable shops have closed. Friendly staff. Great location. Good facilities. Altough I appreciated the lovely Moroccan décor of my room, it was a little dark for reading but this is being pernickety and must be treated as positive criticism. 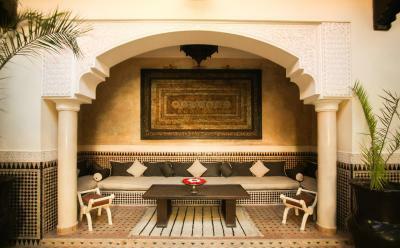 There was fantastic team spirit at this riad. Everyone was very kind, helpful, hospitable and friendly. 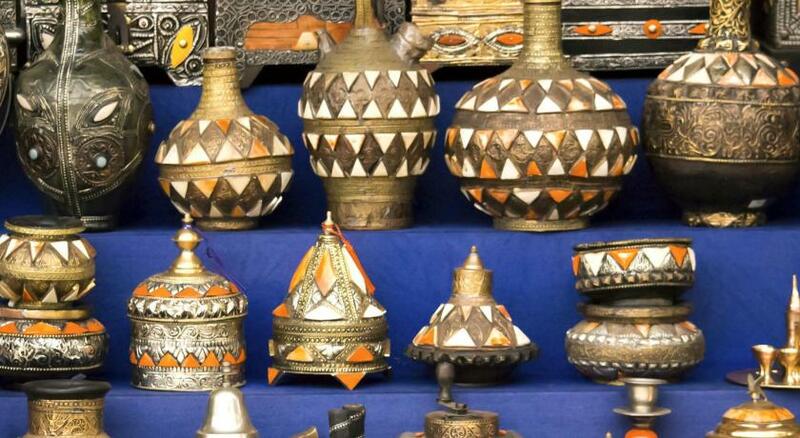 The home-cooked Moroccan cuisine was authentic, delicious and much appreciated by a “foodie”. I was very spoilt as the chef prepared me a chicken pastilla one evening and it was sublime. Wi-Fi signal in the room was weak but it didn't bother us too much as we had 3G on our phone good enough for whatapp calls. Sometimes the rooms can be dark since there are no white lights (although white lights may not go well with the design of the rooms). 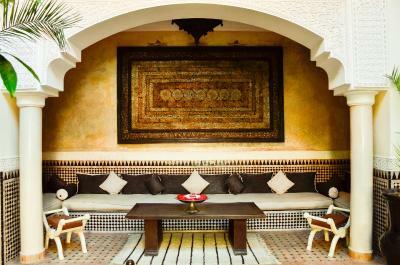 The riad is difficult to find as it is nestled in the middle of the medina so best to get in touch in advance to get clear directions (or arrange a transfer). Once you are there though, you won't want to leave! 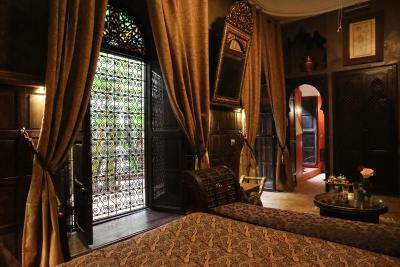 This Riad is an absolute gem and provides a tranquil escape from the hustle and bustle of the surrounding medina. This is topped by Nadia and her team who were excellent hosts and incredibly welcoming. The terraces need updating as well as the lighting. 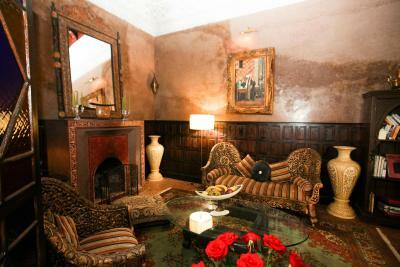 The dark brown Venetian paint in the room made it feel closed in. The bath had a hand held wand for the shower with no place to hang it properly for hands free showering at least in our room. Room too dark. No light in shower. Beds are too hard. No air conditioning. Staff is too controlling about our whereabouts.